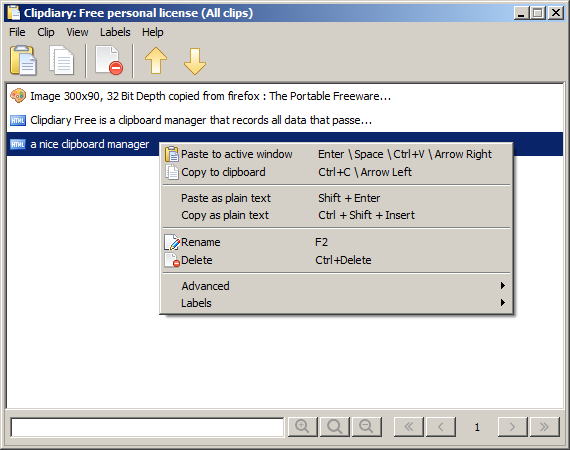 Clipdiary is a clipboard manager that records all data that is copied, making it easy to retrieve any piece of information previously on the Windows clipboard, even after system reboots. The customizable interface and hotkeys make it easy to reference a history of clipboard elements. The program includes database encryption, application blocklist (both to avoid conflicts with games and security programs) and much more. New type in the Snippets - text with formating (RTF). Now you can use macro functions in Snippets. A lot of small bug fixes and improvements. Can't find what you are looking for? This list shows entries with System - Shell Replacements as a supplementary function. You can view more entries with System - Shell Replacements as a primary function.